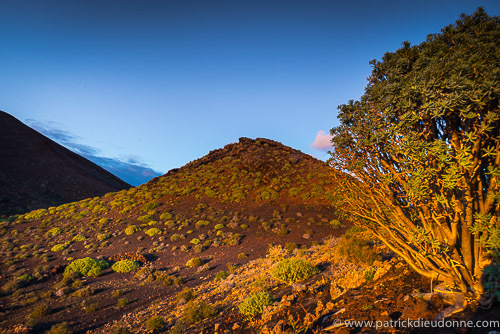 Lanzarote, part of the Canary Islands, has been devastated in the 18th century by spectacular eruptions in series. Other smaller eruptions took place in the 19th century, producing beautiful and young volcanic landscapes, somewhat similar to those of Iceland in places, but with a much more pleasant spring climate (20-25 ° C), and partially covered with a very interesting endemic flora. Men had to adapt to these upheavals to survive, inventing new and very original agricultural landscapes of great aesthetic value (vineyards). Excellent photographic opportunities in a pleasant spring tour, and the charm of Spanish hospitality. * special price (less 5 %) for early bookings (3 months in advance) (1795/1885 EUR). Flights not included. We assist you in your flight bookings (tips and hours). Do not hesitate to contact us. 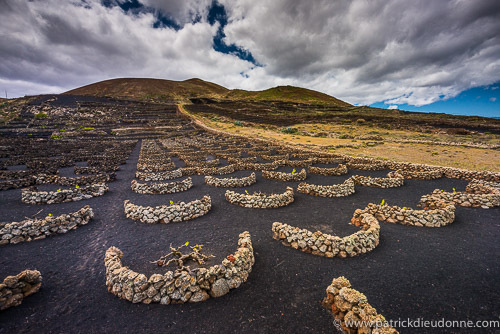 Lanzarote, also known as the "Black Pearl of the Canaries" (due to the color of the volcanic ash that covers its soil in some areas, particularly the Geria wine region), or "the island of 300 volcanoes", is the more volcanic of the Canary Islands. 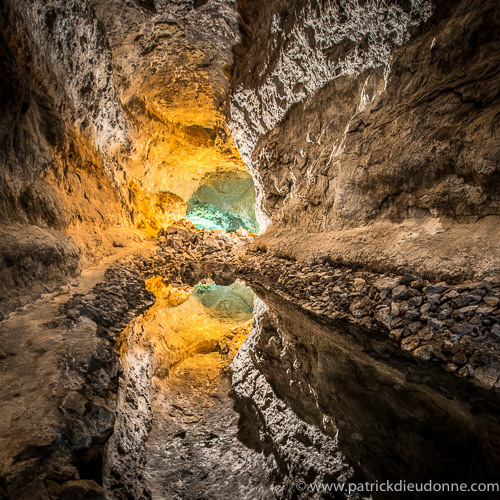 Natural beauty and fragility of such an environment in the face of tourism and human development have been well understood, very early, by Cesar Manrique, a famous architect and environmentalist, island-born. He did everything possible to obtain the classification of the wildest areas, arranging also what should be for tourism with taste and respect for the natural environment (Jardin de Cactus, for example). One year after his death in 1993, the island received the status of "Unesco Biosphere Reserve". 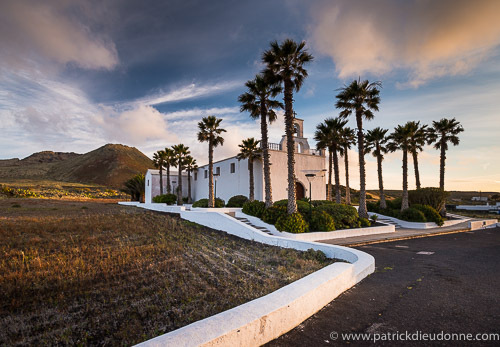 Yet some places are quite touristy places (east coast), but some others are very well preserved (south, west and north-west coast, Timanfaya park and surroundings), you will discover them with me.Lanzarote's natural landscapes and seascapes are spectacular, quite similar to those of Iceland in places, but enjoying a more pleasant climate, and partially covered with a very interesting endemic flora (euphorbiaceae, cacti) .The agricultural landscapes are also completely original, and rich of graphic possibilities, in color or B & W.
During this photo tour, we will learn or improve use of gradient filters, and wide-angle landscape photography. Stitched panoramic are also a great technique to translate vast and open places, often too cramped in a classic format.. Supplement for single occupancy: 150-200 EUR if available. Day 1 (saturday) Paris-Lanzarote (direct flight). In late afternoon, arrival at Arrecife airport. Photography in the evening. Night at our hotel or residence. 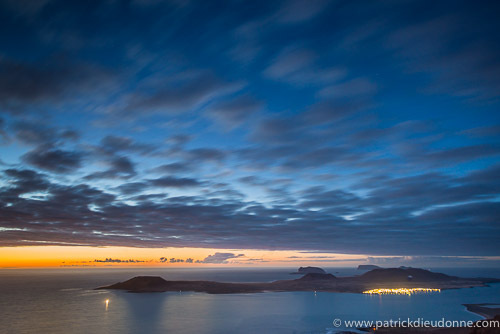 Days 2 to 7 Photography in various places of Lanzarote, according to the weather conditions we adapt our program for the best possible results. 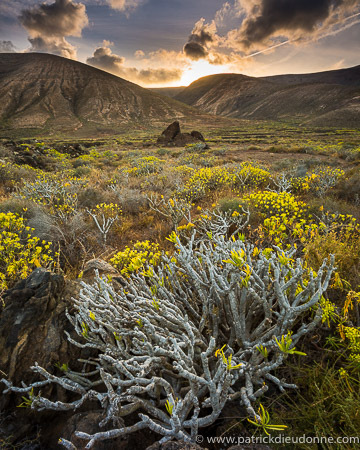 Among the photographic highlights of this trip, the secluded beaches and coves of the south (Papagayo), older landscapes (los Ajaches), the Timanfaya National Park and its surroundings, region of young and spectacular volcanism, the basaltic cliffs of the North west (Risco de Famara), plunging 400 m and more into the sea, the astonishing landscapes of lava and basaltic caves of Jameos or Cuevas, agricultural landscapes on ash at la Geria, which show the exceptional ability of vine-growers to adapt their craft to the huge changes generated by eighteenth century volcanic flows. Lunch and dinner will be taken in small restaurants, always very good, with occasional picnics in some more isolated places. Breakfasts will be taken at our accommodation / hotel. • Accommodation, in hotel or residence. • Lenses for landscape: a wide-angle (below 24 mm), a transstandard 24 or 28-70 mm, a medium telephoto zoom lens (70-200). A longer focal length can sometimes be useful for details (300 mm). A correct level of fitness is required. Walks of moderate level are possible. You should therefore be able to adapt to these conditions and be in good general fitness for a duration of 8 days. Clothing: spring can be rather hot, but some days windy or wet, so pack a diversity of clothes and waterproof items. Don't forget sun protection. We will not walk long distances with equipment. However access to the best views suppose small access walks. You must be physically fit and able to carry your gear and tripod for a few hours. Bring good walking shoes (all leather shoes are recommended), a pair of gaiters can be useful. • Accommodation: Accommodation will be in residence / hotel, fully equipped with kitchen, etc. • Meals: Usually meals taken at restaurants, occasionally home (breakfasts). • Transportation: We'll use a hired car adapted to the group, normally a 9 seater for a group of 6-7. Pre-booking on this site (please use the form above, and contact us for bank transfer of the deposit, then we will arrange booking deposit and final payment with our travel agency. Copyright © Patrick Dieudonne Photo 2017 photos and texts. All rights reserved.